Now many of you all know that I love to play with words and this morning I thought it was quite funny and very ironic that the only way for us human beings to truly ever get IN SECURITY in this world is to be willing to be exactly where God wants us to be! Insecurity on the other hand comes and causes chaos within our souls when we have no idea who and what we are really living for. Insecurity comes when we believe in our minds that we have lost total control of a situation and nobody knows where this spinning wheel will ever stop or if it will stop or if we will get thrown off into oblivion before it stops. Yet on this side of heaven- because we can’t see God in a physical form, we tend to become anxious and allow doubts to creep in and we question whether it is true that God is really there taking care of us just like He said He would! And when we get antsy is when the trouble begins to brew because out of panic we grab the wheel and begin to steer this vehicle in our own strength! We operate from very finite and limited resources. And to add insult to injury, we even blame God for causing the mess that we actually initiated because we wouldn’t patiently wait and trust Him to move! We moved and then we get mad! We try to fix it and then we complain when we took a broken mess and made it even worse! I have been very prone to insecurity over the years. It has birthed all kinds of dangerous anxiety within me. I know that I know that I know that I believe in God and my faith is authentic and my desire to surrender to Him about everything is sincere. But owning an obsessive compulsive Type A driven to the max personality, I have been guilty more times than I can count of trying to help God along by bringing a solution to my situation by myself. I want Him to stamp His approval on my agenda! I want Him to sign off on my plans! I like my plans cause I can see me actually doing something even if what I am doing is making matters worse rather than better! Unfortunately, my kicking in to crisis mode occurs regularly when I don’t see the Lord answering my prayers as fast as I want to see them dealt with. It is not something that I even do consciously; it is just natural for me to fall into the old trap that buys into the myth that God helps those who only help themselves. No- God helps those who are willing to make Him the sole supervisor! God provides all we need when we acknowledge that He is all we need and He doesn’t need our help as much as He desires our trust and obedience! I am willing Lord- just keep my hands out of the pot until the soup is ready! 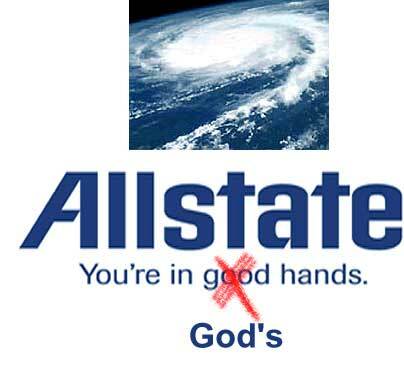 The advertisement for car insurance tells me that “I am in good hands with All State.” Now no disrespect to their company but could there be more stable hands that I might even be better and more protected by being found in them? Why am I so prone to wander Jesus from the places that you place me in? When you tell me to jump into your arms Lord- as I stand along the side of the deep end of this world’s swimming pool- why don’t I believe that you will catch me? Why do I still depend more upon inflated Donald Duck inner tube than I do on you? So today I have a crazy kind of prayer that if you don’t pay attention to it carefully it may sound like I am contradicting myself. “Dear God, I want to be in secure with you Lord!” I might think that I am living safe and sound with my earthly locks and alarms and theft-proof systems but the only place I really want to be is with you Lord. Even if being with you means me having to do some water walking on the raging waters in the midst of a scary storm- I would rather be out of the boat with you than inside the boat far away from your reach! Turn my insecurity that comes from me needing to be in control to being in security that comes from me just laying down my efforts and coming alongside of what you are doing! I am IN SECURE with Jesus! Sounds like a cool T-Shirt doesn’t it? It makes an even better way to live! Just what I needed to hear Rudy. You have a knack for that. . . I too am guilty of being insecure, and I needed to hear I can be In secure with God. My life has been filled with chaos and when I needed him most, he was there and he always has been. I know with no doubt in my mind that if I just allow him he will comfort and guide me. I would really not want to know where I would be today if it were not for my Savior. Thank you.